Note from Mamta; This recipe comes from my late mother in-law Mrs. Kiran Devi, who was a strict vegetarian, not even eating onions, because onions are considered ‘Tamish’ food in India. I wish I had written down some more of her excellent recipes, she was a great vegetarian cook. If you have any special family recipes from the older member of your family, make a note of them now, before it is too late and they are lost for ever! The first time I made it, years ago, it was for a mainly English group of friends and I made it very hot, without thinking! Some of them ate it like eating okras!! No need to say that wine flowed in gallons that day! Most of them now eat hotter food than me and many cook their own. If you grow chillies, there are always enough surplus chillies to make pickles and chilli dishes. This is an easy recipe that uses finger thick chillies because it is difficult to stuff very thin chillies. It can be cooked in advance and lasts in the fridge for 1-2 weeks. It is good for taking on journeys and picnics. As 1-2 chillies are eaten per person, this amount serves 8-10 people. 350 gm. green chillies. Buy the finger thick chillies, so you have space to stuff them. 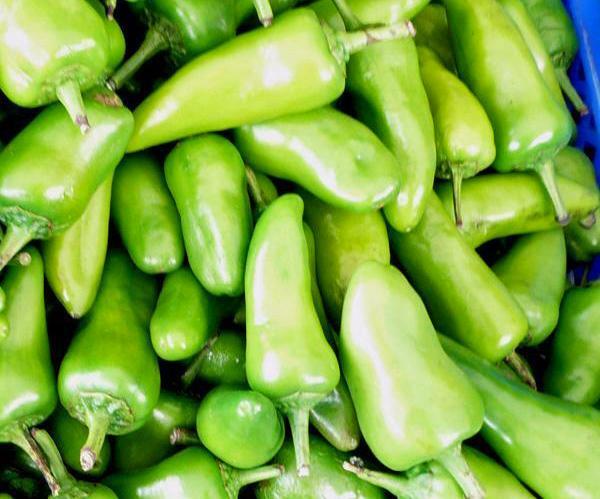 Finger chillies are usually not very hot, somewhere between a hot chilli and green pepper. 2 heaped tbsp. gram flour or besan. Besan is sometimes lumpy. Strain it through a fine sieve before using. 1 1/2 tsp. dry mango powder or amchoor. You can use 1 tsp. tamarind puree* or concentrate. 1 level tsp. 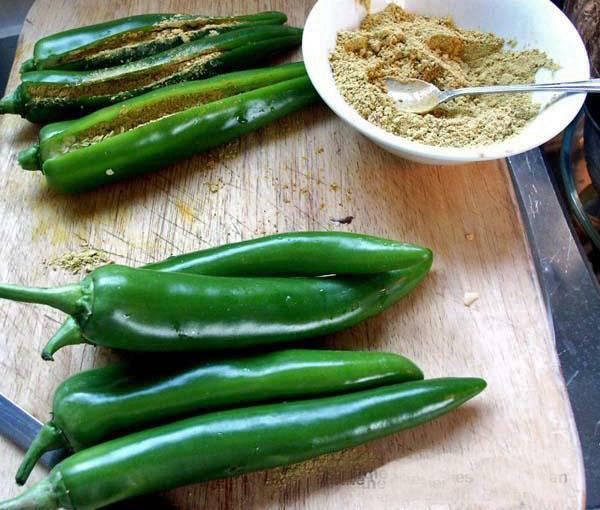 chilli powder, more if you would like them really hot. Wash and wipe the chillies dry with a towel. Slit along the entire length of each chilli. Keep aside. Dry fry besan in a wok or karahi until it gives a nice roast aroma and looks golden brown in colour. Turn heat off. Take besan out in a bowl and mix all spices and salt with it. Divide the mixture in portions, to fill each chilli. Fill one portion of this mix into each chilli, using a teaspoon. Add chillies, stir gently, and cook covered on low heat until chillies are tender. They become dull green from shiny green. Turn the heat up to medium and allow the chillies to get a slightly brown and shiny, fried look. Serve hot or cold with any Indian meal. 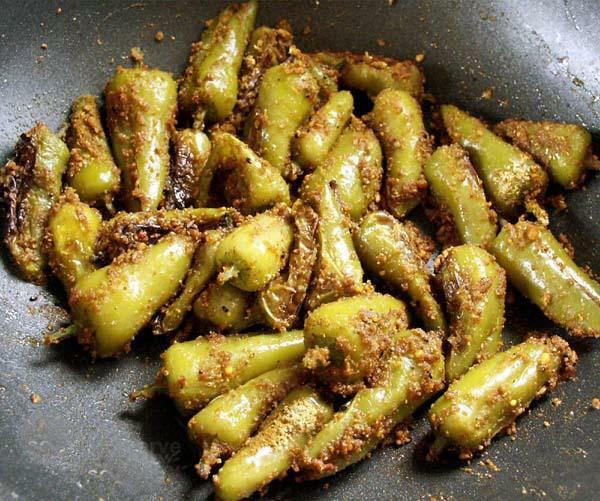 This recipe can be used to make stuffed bhindi (okra), stuffed baingan (aubergine/brinjal/eggplant) and any other small green vegetables like tinda (little, green gourd)and parwal (another small, pointed, Indian green gourd).